This is a computer security guide with information about protecting your password on RuneScape, and info on stopping viruses and trojans from getting onto your computer. A 'virus' is a program made by somebody to mess up your computer. Once they are clicked on, or sometimes run automatically, they cause damage to your computer. This damage can be deleting information, etc. A 'trojan horse' is a program pretending to be something else. a Trojan/Trojan Horse can destroy things on your computer, delete lots of information, sometimes even stopping your operating system (the program your computer uses for everything) to load up. Trojan's can also send information on your computer to the creator of the trojan. A 'keylogger' is a program which sends every key you press to the programmer of the keylogger. These are used to get peoples passwords and other secret information. 'Spyware and Adware' are programs used to keep track of your Internet navigation, without your consent or knowledge. There are all these types of things and more, but by using this guide, you can stop most of them from infecting your computer. Make sure to scan your computer for viruses ever few days, using a good virus scanner such as AVG Anti-virus. On top of that, you need to use programs like Ad-Aware to get rid of other malicious programs. Occasionally, scammers will send emails out regarding your account. They may be titled something like 'You are now a player moderator' or 'We need your account details'. No matter who it's from, this emails are not real. Jagex staff will only contact you through the message center at www.runescape.com. Even if it's from an official-looking email address, like [email protected], the email is a fake. You have been chosen by Jagex Staff moderators for the role due to your past record in the game, your RuneScape character have chance to be changed to a Player Moderator! You are trusted by the Jagex staff and so can be equally trusted by you. After you will accept your new status you will have Silver Crown next to your name. To accept your Player Moderator status and read new rules please login to your account and follow the instructions. We tracked you a time ago and saw that you're a big fan of the game. You'r one of the thousand selected players who we wanted to reward because of there nice and fair playing. Thank you for filling in these details. Warning: If they give you a link, do NOT click it! The link will either contain keyloggers or a virus or will be a scam website where you enter your username and password and bam - they have your account. Also, in the second fake email, it asks you to enter your information. That's not good guys, not good! Don't trust these emails, no matter where there from. Some guy in RuneScape might private message you and start saying: "Hello. I am a jagex moderator..." or something of the sort. Do not listen to them Unless they have a Silver Crown next to there name. Players with silver crowns next to there name are Player Moderators, which means they are more trusted by Jagex. They can mute people, and have priority support from the Jagex staff. True Jagex staff will have a gold crown next to their name. If the person does not have a gold crown next to their name, they are not Jagex staff! Some guy in RuneScape might say "Oh look RuneScape's new update stops you from typing your password in look ******* you try!" Then when you try it doesn't block it and the hacker gets onto your account, changes your password and recovery questions, then bam.. he has your account. Don't fall for this scam! Someone in RuneScape could say "Free armour trimming" and they will then ask you to give them your armor. Do not trade your armour! They steal your armour and you never see it again! Armour trimming is not possible in RuneScape. You can get trimmed armour, it comes from members treasure trails and is tradable to free players, But please, remember, neither free players or members can trim armour! Nobody can! It can only be obtained from treasure trails or buying it from somebody else. All trimmed armour originally came from a treasure trail! Somebody may say 'Free Item Duplicating!' They say if you trade them an item, they will give you double of what you gave them - back... for free. But once you trade them an item, they steal it. Or often you will trade them like 1 gold, they will give you 2 gold. Then you'll trade 2 gold, and they will trade 4 gold. Then you will trade 4 gold, and they will trade 8 gold, etc. But, Once you get to trust them and think that they really are duplicating your gold/item, you will trade a very expensive thing and they will steal it. Or, the other way: Somebody tells you to drop the item you want duplicating and press ALT + F4, then you will get double the items you dropped. But if you press ALT + F4 it quits you out of your RuneScape window, and the scammer steals your items you dropped! Watch out! 2. When you go onto Runescape, and enter your password, make sure you are on www.runescape.com! Do not trust your password with any other websites. 3. You might want to check out a password generator. A good one that has been checked for trackers etc and had none on is Jeremyemery's, found here. An autoer is a piece of software that is supposed to help you gain levels unfairly in the game. For example an auto miner will mine for you while you're not there. For starters, these are completely illegal, stated in the Jagex rules. They have an auto detecting system and you will be banned straight away. Another reason why you shouldn't use autoers is because most of them don't help you, they have keyloggers or other malware on them and will usually steal your password. In other words, don't use autoers or you'll lose your account, one way or another. AVG Antivirus is a good, free antivirus software which you can download it from http://free.grisoft.com. Once you have downloaded the program you should install it and open it up. First, check for updates. Then set it up to how you want to use it. You should scan your computer regularly. I do mine every night, but you don’t have to do it that much. Once every four days should be good, as long as you scan everything you download. To scan your computer, run AVG Anti-Virus and click on test center. You will then get another menu come up. Click on the big image next to scan computer for a full computer scan. You can set it up more in the settings for AVG. Runescape has now introduce a Bank Pin feature. A Bank Pin is a 4-digit number that you must enter to access your bank, or construction mode in your house. After you enter it once, you will not need to enter it again, as log as you stay logged in. For more information, please visit our Bank Pin Guide. Replace 'Rule Breaker' with the person who has broke one of the rules, and then click on the rule they have broken (offensive language, item scamming, etc). Then in the chat bar it should say 'Thank you, your report abuse has been sent' - If it doesn't say that its either because you typed in the name wrong or it has been over 60 seconds since they broke the rule. The moment you see somebody breaking a rule, you must report them instantly. 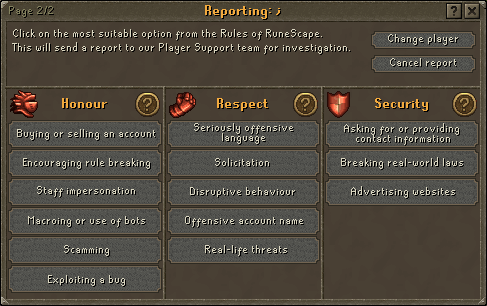 When you report somebody to Jagex, it sends the last 60 seconds of activity from what the player has been doing. So if the report is sent after sixty seconds they wont see the scamming part. For a firewall I recommend Sygate Personal Firewall. Its great, easy to use. When you first install it every time you load a program etc, it will ask if you want to allow the program to run. If it is a program you know then select always do this action and click allow. However, If you have never heard of it just click Disallow. Note: Sygate has merged with Symantec (on October 10, 2005) and no longer supports SPF. However, you can still download the free version from various sites such as Tucows. 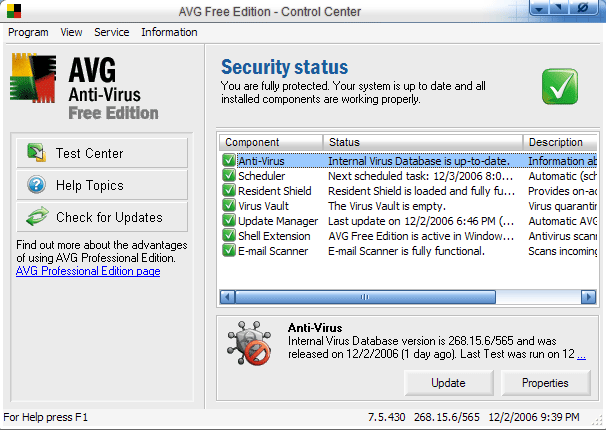 For a AntiVirus program you should use AVG Antivirus. Its a great program, No annoying questions that pop up that you don't understand. Easy to use, And will destroy just about everything bad. You need to check for updates regularly, Once in a while it will check automatically but if you don't check yourself then you might get a virus and because AVG isn't updated it wont recognize it, and by the time it automatically checks it could have completely wrecked your pc. So yes, other than that there's no work to be done at all. It automatically comes on at startup so you don't even need to think about it all the way until shutting your pc down. For Spyware removal you definitely need SpyBot - Search and Destroy. It gets rid of everything! Another Spyware Remover is Ad-Aware, which needs to be updated regularly once again though.